Join us on an adventure of a life time to Baja Mexico and the Sea of Cortez. We will board Seaward, an 82' classic staysail schooner, in La Paz. 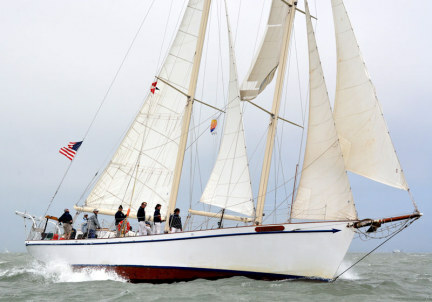 Captain, crew and a chef will be on board our fully stock schooner. All meals and drinks are included and the menu looks delicious! Swim with whale sharks, snorkel with sea lions, spear fish, explore deserted islands, and sail over 100 nautical miles between La Paz and San Jose Del Cabo. Leave the winter storms behind and head south for the spectacular warm clear waters of Mexico! The Seaward is an 82' classic staysail school built in 1988 for both comfortable charters in protected waters and rigorous offshore sailing. She is annually inspected and certified by the US Coast Guard as a passenger vessel for voyages up to 200 miles offshore between Alaska and Panama. She has the highest possible stability rating - for exposed waters - and has smooth and comfortable motion.